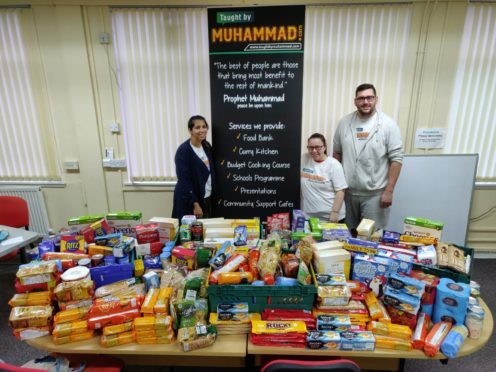 A major campaign which saw more than 200kg of food collected by Dundee’s four major mosques is thought to be the first of its kind in Scotland. Dundee’s mosques: The mosques and the Future Leaders Academy worked together over two weeks in November to collect 260kg of non-perishable food, as well as £170, for a local charity. The city-wide campaign is thought to be the first time all mosques in a Scottish urban area have linked up. The food will be distributed to those in need by the foodbank Taught By Muhammad (TBM) which organised the campaign. Rizwan Rafik, operations manager at TBM, based at Dunsinane Avenue and Bellfield Street, said it was a “very impressive haul”. “It has been an incredible effort,” he said. “I haven’t heard of mosques working together like this anywhere else in Scotland. “I’m not sure why that is to be honest. I think that because we run a foodbank here we know what is needed and we can bring them together to support us. “It’s overwhelming to see the generosity of everyone. We’re very proud of the efforts. Masjid Tajdare Madina, the Scottish Islamic & Cultural Centre, Al Maktoum Mosque, Dundee Central Mosque, as well as the Future Leaders Academy, all pitched in from November 9 to 23. Pupils in each institution were given letters with details about the campaign and food items to bring to the mosque. The effort is part of the Rabīʿ al-Awwal, believed to be the month when the Prophet Muhammad (pbuh) was born. Mr Rafik added: “We plan to do this every year from now on. “The food is much needed as we come into the winter and over Christmas time. “The timing is perfect as our referrals double at this time of year. The charity is currently working on another collaboration with Dundee Foodbank, run by the Trussell Trust, and Dundee United, which will see one of the biggest collections of the year at Tannadice stadium shortly before Christmas. Foodbanks can only accept non-perishable items and items that are in-date. Items can be dropped off at the Yusuf Youth Initiative at 31 Dunsinane Avenue, Monday to Friday 10am-3pm. Dundee’s mosques: TBM’s Rizwan Rafik said donations are the lifeblood of the charity but stressed the importance of checking dates of food. He said: “We received around a dozen crates of pasta from a very generous donor one afternoon. “Although it was a kind gesture, we couldn’t use any of it. “Please check that any food donated is not out-of-date. “We’re so grateful for even the smallest donations. Even one or two tins can make a big difference. “Please don’t feel that it’s too small an amount – it can go a long way.